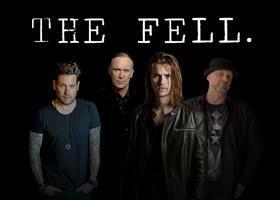 A new year brings new change for alternative rock band The Fell. As Mike Krompass (lead guitar), Randy Cooke (Drums), and Billy Sheehan (Bass) welcome new frontman JD Fortune, former frontman of INXS, fans are promised new music that will be better than ever. After battling to become the winner of the 2005 CBS reality television series Rock Star: INXS, Fortune then fronted INXS until August 2011. Having the experience of touring with INXS, Fortune comes to the band with vast experience and spectacular stage presence. News of the decision to bring Fortune on as the new frontman for The Fell broke on New Year's Eve and the band has been hard at work ever since with every intention of digging deeper and working harder for themselves and the fans. After a long day of writing with famed songwriter Desmond Child (Kiss, Bon Jovi, Aerosmith, Carrie Underwood, Cher, and many others), Krompass and Fortune took the time to meet with us for dinner in Nashville.The chemistry between these two was undeniable. The passion to create meaningful music for fans is not something that can be faked and talking with Fortune proved that he is in this for the right reasons. Krompass and Fortune were excited to share what they have been working on, and we know the fans are going to love it. Having written many new songs together, the guys are gearing up to bring those songs to their supportive fans very soon. If you are lucky, you may be able to catch some of their new stuff later this month as The Fell are set to perform together at NAMM in Anaheim, California on January 25-28, 2018. For more on The Fell, please visit their website (currently being updated to reflect the change) and social media links below.